Watch out for these tricks played by leasing agents. 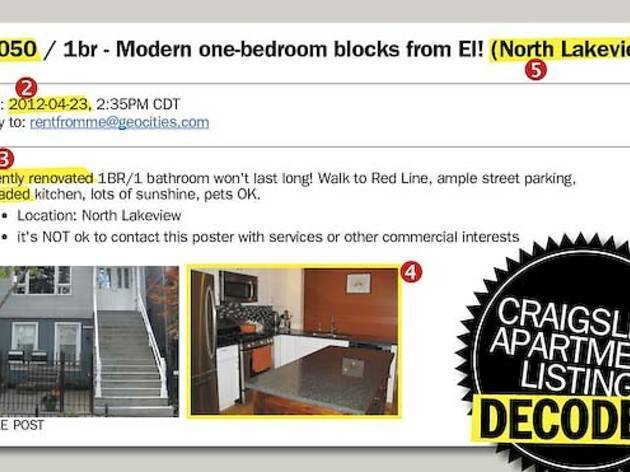 Because Craigslist guards against duplicate ads, agents who want to repost (and repost, and repost) an apartment have to change the listing each time to make it seem like a different ad. Watch out for that and these other tricks. 1. 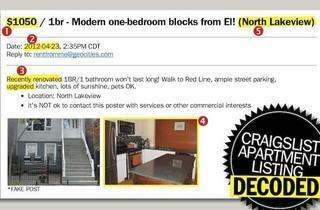 Apartments are sometimes advertised at the wrong price or with expired deals (“first month free!”), leasing agents say, a tactic known as bait and switch. Once you call, the agent will try to sell you on the new price or on something in a different neighborhood, says Amanda Horan, a Dwell leasing agent. 3. At lower price points, recently renovated means cleaned and at higher price points, it means marble or granite was added, Pekarsky says. An “upgraded” kitchen can mean anything from white appliances to stainless steel. Again, ask for specifics when you call. 4. If an apartment is occupied by a sloppy tenant, posting a photo would hurt the agent, says Crystal Banks, a leasing agent with American Realty Pros. In that case, she uses a photo of another unit in the building with a similar floor plan. Disingenuous agents post incorrect photos as part of a bait-and-switch scam, Horan says. When you call, ask if the photos are of the actual unit. 5. “There’s no reason to hide where a building is located,” says Grigory Pekarsky of Vesta Preferred Realty. Make sure you ask for an exact address—the place may be in a different neighborhood than advertised.